• What's an Emolument, Actually? • Which Democrat Can Beat Trump? • Can the Democrats Concede the Midwest? • Could Texas Be the New California? He also threatened to shut down the government again if he doesn't get his wall. The chance that the committee recommends building a wall is pretty close to zero, though. The Democrats on the committee are certainly prepared to appropriate more money for border security in the form of more Border Patrol agents, more Coast Guard personnel (and better equipment for both), more humanitarian aid at the border, better drug-detection equipment at the ports, and more asylum judges, but no wall. Republicans in Congress have no appetite for another shutdown, so if the committee comes up with bipartisan recommendations and Trump vetoes the bill, we may be heading for an override of his veto. The Constitution forbids the president from taking emoluments from kings, princes, and foreign governments. The state of Maryland and the District of Columbia claim that they have caught Donald Trump with his hand in the emoluments jar. But what is an emolument, anyway? Even more to the point, since most of the conservative justices on the Supreme Court try to understand what the Constitution meant to the people who wrote it, what did "emolument" mean to James Madison and his buddies back in 1787? In many cases, it was used in a way suggesting it could be something other than a "profit"
Mitch McConnell is no fan of the Democrats' H.R. 1 bill, and he regularly attacks different parts of it. Yesterday, he went after the provision that would make Election Day a federal holiday and would encourage private companies to give their employees time off to vote, as well. McConnell called the provision a "political power grab." What McConnell very well knows is that larger turnouts always favor the Democrats because the older Republican base are loyal voters who don't need encouragement to vote (and who are disproportionately retired or in jobs with flexible schedules). In contrast, Democratic voters, who on the average are younger than Republican voters, are somewhat flaky and need a lot of encouragement to get them to their polling places. Getting the day off as a paid holiday would undoubtedly increase Democratic turnout much more than it would increase Republican turnout, and that is something McConnell has no interest in. Which Democrat Can Beat Trump? The horizontal axis shows Clinton's margin in the candidate's state and the vertical one shows the candidate's margin. Only one 2018 candidate who is running for president underperformed Clinton in her own state: Sen. Elizabeth Warren (D-MA). Warren got an impressive 60% of the vote in 2018, but so did Clinton. 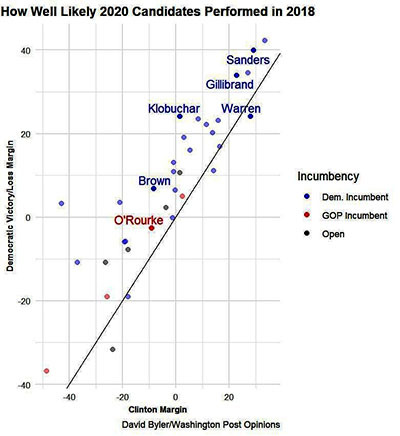 Given Warren's 5-point incumbency advantage, anything below 65% can be seen as underperforming Clinton. On the left, we see that black voters don't care much for Trump. Margins of 89 points are pretty rare in politics, but that is the generic Democrat's margin here. Millennial women, unmarried women, and millennials as a whole aren't much more Republican-minded. 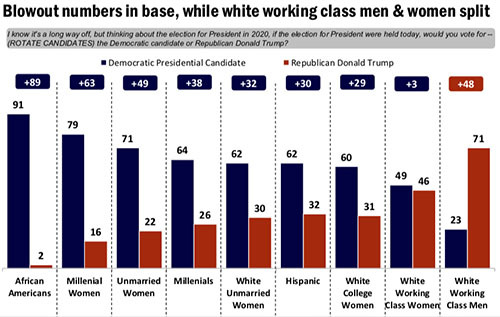 In fact, the only demographic that favors Trump are white working-class men, and they do it by a whopping 48 points. Fortunately for Trump, there are a lot of them. Without them, he would not be competitive at all. The study didn't publish the result for white college-educated men, but other studies have shown them to be slightly Democratic. Who might "Other" be in the Greenberg poll? If it is up to former Starbucks CEO Howard Schultz, it could be him. Schultz announced earlier this week that he was considering a presidential run as an independent. It turns out that this was not just another billionaire who had an idea pop into his head. He has actually been planning a run for months, and doing things that candidates do. For example, he has run six national polls to gauge his strength and to start getting ready to blanket the airwaves with paid ads. He needs to do that to gain public attention so he can hit 15% in the polls, and thus be included on the general election debates. His polls show that he would do much better if the Democrats nominate a progressive candidate, such as Sen. Bernie Sanders (I-VT) or Sen. Elizabeth Warren (D-MA). Schultz also has paid staff working on ballot access in all 50 states. Warren has already taken notice that Schultz called her plan for a 2-3% tax on the net assets of people who are worth over $50 million "ridiculous." She replied by saying: "What's 'ridiculous' is billionaires who think they can buy the presidency to keep the system rigged for themselves while opportunity slips away for everyone else." Can the Democrats Concede the Midwest? Yesterday, we had an item about how the Democrats' choice of Stacey Abrams and Xavier Becerra to rebut Donald Trump's State-of-the-Union speech might be a trial balloon to see if these two rising minority stars can show the path back to the White House by trying to rebuild the Obama coalition. However, the country is much more polarized and racialized than it was in 2008 or 2012 and Obama was a once-in-a-generation politician. If the Democrats were to nominate a minority candidate, especially a minority woman, in the current politicized (not meteorological) climate, they might well be writing off the Midwest. So the question arises: Could the Democrats lose the entire Midwest (including Pennsylvania) and still win the White House? The "easiest" path is for the Democrats to hold all the states Hillary Clinton won and pick up Florida and North Carolina. After all, Obama won both of these states in 2008 (and also Florida in 2012). With possibly as many as a million reenfranchised ex-felons in Florida, the Sunshine State might be gettable for the blue team, although they thought the addition of 300,000 Puerto Ricans would make it a slam dunk in 2016 and they lost both the Senate race and the gubernatorial race. Adding these states to Clinton's total gives the Democrats 276 electoral votes. Stacey Abrams' near miss in Georgia suggests another path: The Clinton states plus Florida and Georgia. That is even better than Florida and North Carolina, and adds up to 277 electoral votes. Sen. Kyrsten Sinema (D-AZ) won in Arizona in 2018, possibly putting that state in play in 2020. 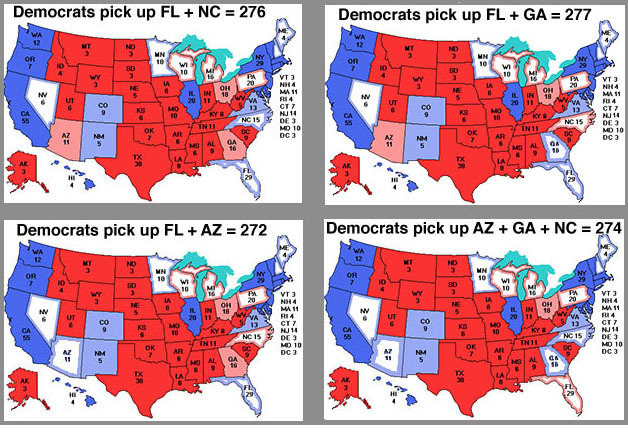 The Clinton states plus Arizona and Florida adds up 272 electoral votes. Talk about a tight race! But 272 > 270, so it would do the job if Maine does not give one of its EVs to Trump. But what if conservative, white Midwesterners are moving into The Villages development in northeast Sumter County, FL, 45 miles northwest of Orlando faster than ex-felons are registering to vote? Could the Democrats get to 270 without Florida? The answer is yes, but it would require winning all of Arizona, North Carolina, and Georgia—a tall order. Could Texas Be the New California? A respite, though perhaps only a brief one, from wall-to-wall shutdown talk! Because it's not a political football, U.S.-Canada border security gets only a fraction of the funding and personnel U.S.-Mexico border security does. There are, in fact, about 2,000 Border Patrol agents assigned to the northern border compared to 18,000 for the southern border. Since the northern border is 2.82 times longer, that means that for every mile that the average agent on the U.S.-Mexico border has to patrol, the average agent on the U.S.-Canada border has to patrol more than 25 miles. They do their best, relying on cameras and on motion-detection technology that was developed for use in the Vietnam War, but quite often a breach falls under the purview of an agent stationed 50-100 miles away, who must decide if it's worth 1-4 hours of driving to deal with. There are numerous unmarked, unnamed, dirt roads that cross the border (especially in the Great Plains and the West) in which "border control" consists of a stop sign and a shack with a telephone under which is a sign telling travelers to please call some number to announce their crossing and declare any goods they are moving between the countries. 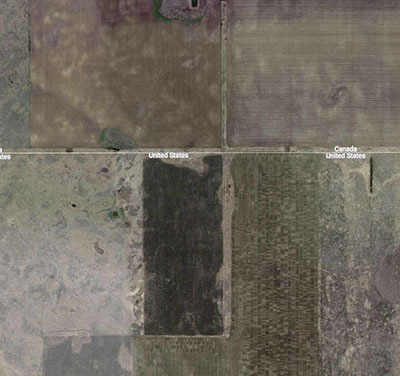 If you go to Google maps, turn on satellite view, and scan along the border, you will find a number of agricultural areas like this one in which a dirt road just crosses the border with not a lot to stop anyone. There are also parts of the U.S.-Canada border that are all-but-impossible to secure, even with adequate funding, because the local terrain gives so much cover to miscreants. Especially tricky are the densely-forested portions in northern Vermont and Maine and the long and often snowy Alaska-Canada border, which attracts folks who dress in white camouflage. Some portions of the border have Indian reservations (particularly Mohawk), which sometimes span both countries, and in which the U.S. government's authority is sometimes very limited. The quantity of goods moving between the United States and Canada is vast, which could make it easy to stash illegal stuff in among legal goods, as happens along the U.S.-Mexico border. Since vehicle inspections are fairly limited, nobody has the foggiest idea as to how much this might be happening up north. In short, it's fair to say that the U.S.-Canada border should get a lot more attention that it does. But other than Sen. Jon Tester (D-MT), nobody seems to be talking much about it. Maybe if MS-13 starts carrying hockey sticks as weapons. Needless to say, only Robert Mueller knows why Robert Mueller does what Robert Mueller does. Well, maybe Andrew Weissmann could make an educated guess, but not a lot of folks not on Mueller's team know what they are up to. However, your supposition does not seem consistent with his general character or his track record. He was hired to do a job, and to remain above the political fray, and it's likely that he will do exactly that. If he needed another six months to fulfill his mandate, we think he'd take it, and dare Donald Trump to try to fire him. And if he had finished six months ago, he would have submitted his report and closed up shop. What does seem possible, however, is that he's concluded that going after members of Trump's family is a can of worms that he is not in a position to open, and that the legal and political issues are such that it's up to Congress to decide what to do about Eric, Donald Jr., Ivanka, and Jared. Before we answer your main question, we're going to object to a couple of your JFK-related assertions. First, the U.S. began to get seriously involved in Vietnam in 1954, which means that Dwight D. Eisenhower, Kennedy, and Johnson all bear at least part of the responsibility for the conflict. Second, it is true that JFK is still pretty popular with the general public—last year's Quinnipiac survey of post-World War II presidents put him in third place, behind only Ronald Reagan and Barack Obama. This is undoubtedly because he was good looking, and gave good speeches, and hung out with the Rat Pack, and died young, and so forth. Scholars, however, are not so sure about Kennedy. The most recent survey of academics, conducted among members of the American Political Science Association in 2018, put him at #16. Not bad, but hardly among the "greats," or even the "near greats." In the four major surveys of scholars immediately preceding the APSA's, he came in 11th, 15th, 14th, and 8th. Moving on to your main question, there is no doubt that the Vietnam War is the big, black mark that is being held against Johnson. He does bear a fair bit of the responsibility, of course, since he escalated the war so aggressively under false pretenses. It does not help that the wounds of that conflict are still open, to some extent, since many of those who served or protested are still alive. Johnson also gets dinged some, we would imagine, for being a shady political operator, and for being among the most vulgar, crass men ever to occupy the White House. For example, if you haven't heard the phone call in which he requests custom-made pants from Haggar, it's really something. That said, Johnson has much in common with one of his predecessors, namely Harry S. Truman. Both were Southern Democrats known for their potty-mouths. Both escalated an unpopular conflict in Asia in service of Cold War goals. Both, despite less-than-enlightened racial language behind the scenes, took proactive steps on behalf of civil rights. Both got behind progressive legislative programs (the Fair Deal and the Great Society, respectively). And both got run out of office at the end of their first full terms, and were very unpopular in their retirements. Over time, however, Truman's star rose once again, as the memories of Korea faded, and the trials of subsequent Democratic administrations (particularly Jimmy Carter's) highlighted how much Harry S. had actually accomplished. It's probable that LBJ will enjoy a similar renaissance, particularly since the fights over Obamacare and voter ID laws have reminded everyone how significant the Great Society really was. In fact, in the last five polls of professional scholars, Johnson actually outperformed Kennedy in four of them, including coming in 6 spots above Mr. Camelot (i.e., #10) in the 2018 APSA survey. Absolutely. First of all, as we've pointed out, once someone questions their loyalty to Trump one time, it makes it much more likely it will happen again, and maybe even that they will abandon him permanently. The shutdown (oops, guess it did sneak into today's Q&A) was very bad for him on that front, as it appears to have dinged the President several points, and to have dinged the GOP as a whole by about 8 points. That's actually a double whammy for Trump, since it means a sizable chunk of his base has begun to question him, and it also makes it likely that more Republicans will jump ship on him. In addition, if Robert Mueller's report comes back and it's loaded with evidence and credible accusations of misconduct by Trump, it could cost the President dearly. Yes, some of the base will spin conspiracy theories and talk about the deep state, but some will be compelled to confront reality. That's what happened with Richard Nixon; once the evidence of his misconduct got substantive enough, his base of support split in two, with about half of them abandoning him and the other half staying loyal to the bitter end. Finally, if the economy takes a dive, it will be the final straw for some of the base, particularly those who have been hard-hit by either the tariffs, or by the shutdown, or both. There may be nothing that makes voters angrier than being hit in the pocketbook. It should also be noted that these are just some of Trump's more obvious Achilles heels. There are other longshots out there that could potentially do him in, like Vladimir Putin announcing that he's tired of waiting for Trump to deliver on his promise of ending all sanctions in exchange for land for Trump Tower Moscow, or Trump's tax returns seeing the light of day and making it very clear that he's been up to something shady, or a tape of him using the n-word coming to light. We've mentioned the NPVIC a few times, but just to make sure everyone is on the same page, it's an agreement among states that they will award their electoral votes to whoever wins the popular vote, thus effectively circumventing the Electoral College. The agreement, and the various state bills signing onto it, only take effect if at least 270 EVs worth of states commit. At the moment, 11 states and DC are on board, making for a total of 172 EVs, or 63.7% of the total needed. If the bill in Colorado gets through the state House, and gets a signature from the governor (both things are likely, but not guaranteed), then it will be 181 EVs and 67.1%. The Supreme Court has weighed in on this question a couple of times, and has said it's not their place to overrule what it says in the Constitution. In fact, their exact verbiage was that in this area, the states are "supreme." If the compact had been in place for the entirety of U.S. history, then it would have flipped five elections: Democrat Andrew Jackson would have beaten National Republican John Quincy Adams in 1824, Democrat Samuel B. Tilden would have beaten Republican Rutherford B. Hayes in 1876, Democrat Grover Cleveland would have beaten Republican Benjamin Harrison in 1888, Democrat Al Gore would have beaten Republican George W. Bush in 2000, and Democrat Hillary Clinton would have beaten Republican Donald Trump in 2016. So, every time the Electoral College has overruled the popular vote, it has been to the detriment of the Democrats. Of course, that comes with the caveat that the Democratic Party of 1824 and the one of 2016 are hardly the same, and also that two of those five Democratic losers came back to win in a rematch (Jackson in 1828 and Cleveland in 1892). It's also worth noting that if Tilden had won in 1876, the Reconstruction might not have ended as soon as it did. Would the U.S. be in a better place today if the federal government had been in the South, protecting black Southerners' civil rights, for at least a little longer? We'll never know. You're right, of course. We pored over that ponderous document for an hour, but did not notice that Intelligence has its own section, and plays by a slightly different set of rules (those rules start on Page 12, for those who wish to read for themselves). Apparently, that committee gets extra time because there are some special rules about the membership, like one person from each side has to be a member of the House Judiciary Committee, and they all have to have high-level security clearances. That said, we were still correct in noting that the Committee does have mandatory duties that have to be performed in the next several weeks. Yes, it is theoretically possible for House Democrats to change the rules for how committees are organized, or appointed, or run. However, they are loath to be too aggressive, knowing that one day the shoe will be on the other foot, and it will be the GOP making the rules. That said, if the Republicans had dragged this out for too long, Speaker Nancy Pelosi (D-CA) & Co. might have gone down that road. In any case, the reason that the GOP's alleged stall tactics were viable under the rules as currently written is that the first item of business for each committee is for all members to meet and to set rules for the rest of the congressional term. That includes deciding exactly how many members will be required for a quorum (it can be as few as two people, for some purposes, or as few as one-third of the committee, for others). Once the rules are in place, and the quorum line has been set, then the Democrats can do as they see fit and the GOP members of the committee can't say "boo." As it turns out, though, these questions are now moot. Kevin McCarthy announced his picks for the Committee on Wednesday. He gave some semi-plausible excuses for the delay, namely that he was waiting for waivers/security clearances for some of his appointees, and that for the 70-plus members of his caucus who were interested, but didn't get the assignment, he wanted to break the bad news in person. This does not explain why he couldn't announce the names of the members who did not need waivers/security clearances, nor why he's never before felt the need for the "personal touch" in these situations, which is why his excuses are only semi-plausible. But whether McCarthy is fudging or not, the Committee will soon be open for business.